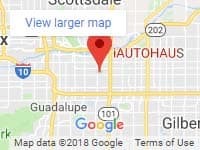 If you are searching for an experienced European auto repair center in Tempe, Arizona, that specializes in Rolls-Royce repairs, look no further than the iAUTOHAUS BOSCH Authorized Service and Repair Center. At this one-stop-shop, we possess the expertise and experience to handle all your luxury automotive service or repair needs to maintain and protect your valuable investment. At our BOSCH Authorized Service Center, we are staffed by European automotive experts, and we also possess cutting-edge, high-tech factory equipment to help you stay up-to-date with your Rolls-Royce maintenance schedule. When handling repairs of your luxury vehicle, we only use factory or OEM replacement parts. With every visit, you can expect quality workmanship, as well as courteous, prompt and proficient service from our Rolls-Royce repair specialists. You can easily book an appointment for your Rolls-Royce repair service in Arizona with iAUTOHAUS experts by calling 480-317-0783. Why Choose iAUTOHAUS to Service your Rolls-Royce Luxury Car? Need Additional Help? We Offer Auto Repair Financing! At iAUTOHAUS, we understand emergencies and accidents happen that are beyond your control. We make it easy and convenient to pay for unexpected Rolls-Royce auto repairs with 0% interest O.A.C. car repair financing for six months with a BOSCH Service Credit Card. Additionally, we offer a range of monthly specials to financially assist you when you are in need of Rolls-Royce repair in Tempe, Arizona. These specials are updated regularly, so be sure to check back to see if any apply to the Rolls-Royce service you require. Rolls-Royce owners understand just how special Rolls-Royce ownership is, that is why finding the perfect place to have your Rolls-Royce serviced and cared for is so important! Whether you own an Audi, Bentley, BMW, Jaguar, Land Rover, Lexus, Lotus, Maserati, Maybach, Mercedes-Benz, MINI car, Porsche, Smart car, Volkswagen, Volvo, you can count iAUTOHAUS to handle your vehicle with care. Find out what monthly specials are currently available to Rolls-Royce owners. Give us a call at 480-317-0783 to schedule your Rolls-Royce service in Tempe, AZ today. Not a Roll- Royce owner yet? We can help with that, as well. At our iAUTOHAUS dealership, we offer a wide selection of pre-owned vehicles manufactured not only by Rolls-Royce, but also BMW, Mercedes-Benz, Audi, Porsche, and more. With financing rates and extended warranties available, now is the time to get into the luxury automobile of your dreams.